Texans have never been shy about showing pride in their state. 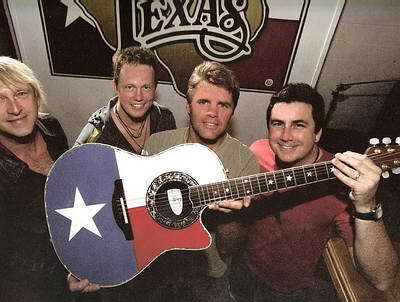 So it's high time for someone to offer, in the form of a large coffee table book, examples of some of the many ways that Texans show and display their state's famous flag. 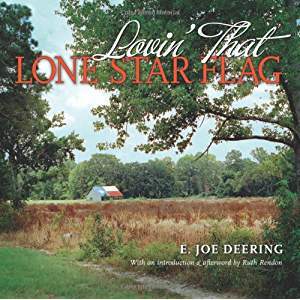 Lovin' That Lone Star Flag, published in a large-size hardcover binding by Texas A&M Press, does this, presenting over 125 pages of colorful photographs vividly depicting this pride. Never before have so many spirited and eye-catching displays been collected into one single place. Explaining Texans' affection for their state to outsiders can be difficult. To Europeans, I have used the example of how the Catalonians express Catalonia's distinct culture, attitude and customs even though it is now part of Spain. Texas, of course, has followed its own long and storied road from European colonial territory, to Mexican territory, to existing as The Republic of Texas, and finally resting comfortably after 1845 as the 28th state of the United States. How is Texas different from the other states regarding their flag? Here's one example: Since 1933, the state codified an actual pledge of allegiance to the Texas flag, which is recited as follows: "Honor the Texas flag; I pledge allegiance to thee, Texas, one and indivisible." Folks attending special state ceremonies often recite this, but lots of others are unaware that their state has such a specific codified pledge. The book is overwhelmingly composed of photographs by E. Joe Deering, who struck upon his idea for the book while on a photography assignment for the Houston Chronicle newspaper in 2002. A native of Michigan, Deering spotted a giant Texas flag painted on the side of a building in Cisco, Texas, a small, rural town in the north part of the state. "Well, isn't that interesting?" he thought. From there he began his photography project by taking pictures of any representations of the flag while traveling around the state. Deering's images sharply capture the universal enthusiasm behind Texans' patriotic emotions behind their flag. The pages are filled with vivid images of the Texas flag, whether on hot air balloons and hang gliders or the sides and roofs of buildings. The Lone Star flag is painted on vehicles and emblazoned onto various and varied articles of clothing and jewelry. The book includes photographs of flags that have been custom made to fit the vastness of their own enthusiasm. Bruce Lavorgna, a Texas resident but not a native, sums up the attitude very well: "I wasn't born in Texas but I've been in the state for almost thirty years and I'm proud of where I live."